The prices are excellent compared to other dealers. Great service and friendly staff. Thor Motor Coach Siesta Sprinter Diesel RVs for Sale at Motor Home Specialist, the #1 Volume Selling Motor Home Dealer in the World as well as #1 Thor Motor Coach RV dealer. The class C RV lineup, like the Chateau also features several different types of builds and chassis platforms too. The Super C diesel is primarily a Ford F-550 Super duty diesel chassis platform with even a large diesel generator option. The Siesta Diesel is similar to the Chateau Citation B+ in floor plan and features, but offers a unique exterior paint scheme and color pallet that make it distinctively different. The Siesta Sprinter gas models are also complimented by the Chateau Class C RV line-up, but currently offer different HD-Max sidewall colors, graphics packages and interior decors. Contact at Motor Home Specialist representative today for up to date information and available features on these and many other new class C models from TMC including the all new Thor Motor Coach Synergy sprinter diesel, Thor Motor Coach Quantum, Thor Motor Coach Gemini and the Thor Motor Coach Compass. 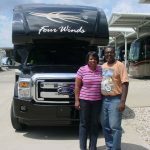 Click here to view Thor Motor Coach Class C RV Reviews.